I carry my Moleskine Pocket Sketchbook with me every day, and by the time I am done filling the notebook and move on to the next, I have usually stuffed it full with clippings, curled pages, photos and other detritus of life. The binding is swollen from all that extra bulk, and the book is usually starting to come loose at the binding. I needed a way to keep my notebooks in better shape for the 6 to 8 months that they travel with me, as I fill them up. I have tried various covers and ways to protect the binding and the book itself, but so far nothing has been a perfect fix for my problem. I have experimented with making my own covers, but this new cover from Gfeller is the best solution that I have found. I will tell you up front that they are not cheap. I debated buying mine for several years because of the price, but I finally decided to spend the $75 and buy one, and I am very happy with the slip cover. I admit, I was somewhat surprised at how thick my Moleskine became when I put the case on, it adds a certain bulk that wasn’t apparent from the photos that I looked at online before buying. The English kip leather that they use for these cases is very durable and though each layer is very thin, by the time you add up the outer casing, and the inner lining, that adds 4 layers of leather to the thickness of the notebook when closed. My Moleskines are usually quite stuffed already, and so they can get very chunky. The construction of the cover is very detailed, I searched in vain to find where the stitching begins or ends, there are no sharp edges or rough places, it has been carefully made, and very well designed. The inner flaps extend beyond the outer edges so that there is no bump to write over, and the slot cut into the leather so that the elastic strap can still be functional is perfect. The leather was very pale and almost cream colored when I first received it, but over the past few weeks I have noticed it turning steadily darker to a middle caramel color right now, and according to Gfeller, it will continue to darken with more exposure to UV light, which certainly won’t be a problem in Florida! I also expect the soft leather to conform to the edges of the Moleskine, and take on a distinct character. 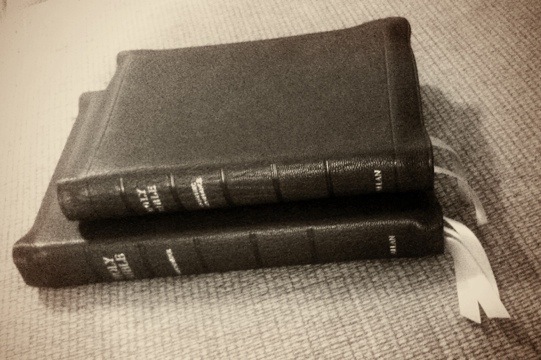 R.L Allan Bibles: Oh The Choices……. I ordered both of these bibles looking for a lifelong investment, but am having terrible trouble deciding between them. I cant really justify keeping both of them (because together they cost more than $300) and besides I like having only one, to keep everything together, and not be wasteful. Needless to say they are amazing pieces of hand-worked art. Gold Gilt, and Goatskin Leather. They are almost fluid, and you really have to pick one up to understand. In any case, I have had them for about a week now, and I am still at a loss as to which one to keep. Size vs. Readability…. Such a conundrum to be in…..